This entry was posted in Antidepressant, Antipsychotic, Success Story on May 10, 2009 by ATMC Team. I am so very grateful to Alternative to Meds Center … The best thing I could ever have done for my life is this program. My name is Matt and I’m 25 years old. I had been given the diagnosis of Bi-Polar Disorder about seven years ago, and it was awful. The doctors started to put me on psychiatric medications to stabilize the ups and downs of my behavior. However, the side effects from these drugs (Geodon, Lithium, Cymbalta) were life-altering for me, and I always felt tired which made me get into two different car accidents while I was driving to work since I was so drowsy as a result of the medications. At work I had a difficult time functioning and in life in general since never felt good about myself and had a consistent lack of energy. My father found Alternative to Meds Center, while he was searching online (alternativetomeds.com), which is a place that could wean me off of my psych meds in order for me to get back to living a successful life. At first I was reluctant but I then decided I would give it a shot. I came to Alternative to Meds Center from Michigan almost ten weeks ago. When I arrived I saw an Orthomolecular Doctor that performed some tests and said I had been misdiagnosed and that actually I was Hypoglycemic. The doctor also said that many if not all of my issues were a product of too much caffeine, sugar, and white flour. The doctor said if I were to eliminate those things from my diet and began a vitamin regimen I would see dramatic changes in my life. Recently I finished tapering off my medication. I had no problems at all tapering off of my medication with the staff’s help, exercise and a healthy diet. I’m already noticing some amazing changes; my level of energy has probably tripled. I’ve been working out at least 3 or 4 times each week and I’ve also started going to some classes which are helping me a lot. My family has told me I sound so much better and that it seems like I’m much happier compared to the last time that they talked to me. All of the people here who I live with have said that I’m an entirely different person than when I first arrived and cannot wait to see all of the positive end results after the program is completed. I think that this is great and I feel very excited about my whole life ahead of me. For once in my life I now feel that I am able to accomplish great things. And I can’t believe how serious the affect the medication had on my life. I feel like I am an entirely different person and I’m so happy that I am med free. 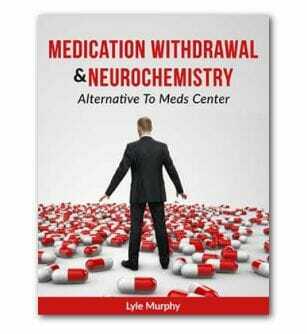 I am so very grateful to Alternative to Meds Center. I can only hope that other individuals take full advantage of what this program has to offer. Anyone who reads this and desires to have the same help I’ve received, I would urge to call the Alternative to Meds center at anytime; day or night. Their staff is available to help always. The best thing I could ever have done for my life is this program.